Did you hear that? I think I heard a collective *sigh* from quilters around the world! Basting is one of those necessary evils of quilting. I don’t think I personally know a quilter who loves this step of the quilting process. I have a theory that the vast majority of UFO’s are created once this step becomes necessary. Are you one of those quilter’s that collects quilt tops? It’s time to get over the fear of basting so that you can finish up those quilt tops. Some of the beginners out there immediately conjure up an image of bulbous syringe and a turkey. Relax, we’re not cooking Thanksgiving dinner over here, at least not for another month. Sometimes basting is approached with as much trepidation as a holiday meal. Basically basting means that you temporarily adhere/attach your three quilt layers together(top, batting, backing) so that you can take it to your machine where thread and a quilting design will hold your layers together permanently. There are three basic methods that I know of for basting a quilt: needle and thread, pinning, and spray basting. Each method has it’s own set of challenges and requirements. I’ll try to briefly out line each method. Did you know that most long arm quilters (myself included) will gladly thread baste a quilt for you for a nominal fee? You can use the same method as outlined above for pin basting as well. For this method you should used curved safety pins specifically for quilting. They make it easier for the sharp end to come back up into your quilt sandwich while it’s taped down. You may also want to use a stylus, chopstick or other tool to slip under the pin and help you close it. I use an acrylic cuticle stick from the drug store. It really helps save your fingers on a large quilt. Here is the Sharon Schamber you tube video that shows you how it’s done. Of course you can always do it the hard way and spread out on the floor on your hands and knees. Pros: pins are sturdier than thread, pins are relatively cheap, you remove the pins as you sew so you don’t have anything to remove once you are done. Cons: You’ll get poked - it’s inevitable. It’s really annoying to pin on top of carpet, you’ll ended up pinning the carpet in a couple of spots. You’ll want to plan ahead so that you don’t put pins in the way of your quilting line (i.e. if you are stitching in the ditch you won’t want to put pins along the edges of the block.) It can be a pain to have to reposition pins because they are in your way. You have to stop and undo the pins as you stitch. That being said there is a cool product out on the market called Pinmoor. They are colorful “caps” that slide over regular quilting pins to cover the sharp ends. They are easier to reposition since you don’t have to fight with the clasp of a safety pin. They are rather pricey at $15 for 50 pieces. That’s barely enough for a baby quilt. I’m always surprised to find that people have not heard of this wonderful tool. Basting spray is a low tack adhesive/glue that comes in a can. It usually sells for $10-$15 depending on where you find it and the brand. One can should be able to do 2-3 queen size quilts or several small quilts. Make sure you buy one for fabric (preferably quilting) rather than one for crafting. The ones made for quilting are especially formulated to be repositionable and won’t gum up your needle. I’ve used June Tailor’s basting spray with no problems. I have even had quilts basted together for over a year before I get to them! If your spray baste is coming out in clumps or in strands like silly string you need to get a new bottle! This stuff should come out like hair spray. Speaking of hair spray, my friend Gene has had success using Aqua Net hair spray as a basting spray! At around $3 a can it sure is a cheap alternative so you can get even more chocolate. I wrote a post a couple of years ago about how I spray basted my quilts (here.) I really think that the board method used by Sharon Schamber could also be adapted to spray basting. I’m going to try it out the next time I have to baste a quilt. So now that we covered the different methods of basting let’s talk about why we need to baste. I thought the point of the walking foot was to move all the layers through together? The walking foot does NOT replace the need to baste the quilt sandwich. The walking foot minimizes the shifting of the layers but it doesn’t keep the layers together on it’s own. Basting every few inches stabilizes the quilt and insures that your layers will stay together until your quilting holds the sandwich together. Don’t skip the basting step or you will end up with huge puckers and you will be disappointed with the results. Let me know if you have any questions about basting. Now go make yourself a quilt sandwich, grab your walking foot and meet me tomorrow as we start with the designs! I've used pins and the spray, but have never gotten more than a couple quilts from a can...and not as big as queen size. Maybe I'm using too much. My husband also HATES the smell...whines about it for a long while after. It is pretty bad. I only buy it when it's 50% off or I have a coupon. The pins work too and you can also get those on sale. The sewing type of basting looks like a lot of work to me, so I likely won't try it any time soon. =) Thanks for sharing today. Basting isn't just the bane of quilters. I've yet to make a quilt but still run into basting when sewing toys and dolls. It's really annoying (it's like you have to sew twice!) but it's worth the few minutes it takes. I get such nice result when I baste doll pieces together instead of just trying to cram it all under the needle without basting. 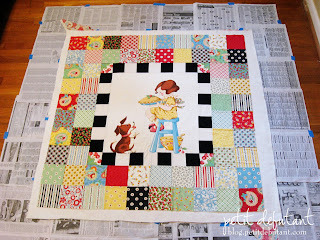 Now you have me wondering if the spray stuff would work for no quilty projects? Might have to try it if I find spray on a good sale. Thank you for doing this post, although I have been quilting for over a good 6 or 7 years or more it is alway good to learn more or refresh your mind. I perfer spray basting over anything else. Thanks for the basting hints. DOn't underestimate the importance of having all the layers flattened and stretched first. I found that the hardest part to master! I had completely forgotten about Sharon Schamber's basting method. When I have more time, I will have to watch that again. Maybe I can adapt it so I am not crawling around in the floor when I baste. You missed out the fourth option - fusible batting. I used it when I made my first (and only!) quilt. I love the fusible batting. Works great everytime. I do pin, alot. I found a bunch of foam ear plugs on sale, they work great on the end of pins. No more Ouchies! Dependiendo del tamaño de la colcha creo que un método es mejor que otro. Mi pregunta es: ¿cómo hilvanar el centro en una colcha muy grande? I just recently heard about using hair spray,will have to give that a try after finishing up what I have now. The hand basting method is Not for me! Until the discovery of the spray basting method I always pined. I use the board method with the spray and then add a few safety pins for extra security. I've basted a few large quilts with great success using this method. The board method and spray basting is a knee saver. Since I posted the tutorial in the first example of your post, I have quit basting with thread (it takes FOREVER) and gone to spray basting using exactly the same process of rolling/unrolling the top and backing on boards. It's working great with spray basting and is so much faster. I've done several queen-size quilts this way without a single pucker anywhere! I never knew there were alternatives to basting on the floor. Excellent!